In a study of 100 patients with newly diagnosed advanced lung cancer, patients ranked faith in God just beneath their oncologists' recommendations, as the most important factor in their decisions about treatment. Another cross-sectional study on advanced cancer patients found that spiritual well-being was correlated with quality-of-life measures. Similarly, patients in a palliative care hospital reported end-of-life despair if they also reported low spiritual well-being. A needs assessment survey of outpatients with cancer found that many reported unmet spiritual needs, including 40% wanting help in 'finding meaning in life,' 42% in 'finding hope,' and 51% in 'overcoming fears.' Peace of mind, spiritual satisfaction, and social satisfaction were considered to be very important in nearly two-thirds of the cancer patients. However, the spiritual needs of patients with advanced cancer have not been systematically studied. In view of the all that was mentioned earlier, we undertook the task of assessing how spiritual well-being (Sp WB) is associated with distressing symptoms, anxiety, and depression, in advanced cancer patients. We also studied the influence of spirituality on other dimensions of QOL. This study was descriptive and cross-sectional in nature. The study sample was recruited from in-patients in a hospice and palliative care center catering to the needs of cancer patients. All the subjects in the study group were diagnosed with advanced cancer (no further curative treatments were available), including all forms and types of cancers. All consecutive admissions in the wards were recruited over a period of three months. On an average, the assessments were done one week after the admission to the hospice. The sample included patients above 16 years of age of both genders, who were cooperative and communicative for the interview. Written informed consent was obtained from the patients. Those who had alcohol or other substance abuse or dependence, a past history of major depressive disorder or bipolar disorder, or any neurological disorder were excluded. The study protocol was approved by the Institute's Ethics Committee. The study sample was assessed using the following instruments. Hospital Anxiety Depression Scale (HADS) - This is a brief self-administered scale, which has been specifically designed for use in patients with co-morbid physical illness. It consists of 14 items, seven each recording depression and anxiety. Each item has four possible choices scoring from '0' to '3'. The depression subscale has been constructed in such a way as to largely exclude somatic symptoms. This subscale consists of items that predominantly screen for anhedonia, which is considered a symptom characteristic of the endogenous subtype of depression. Validation studies have established a high internal consistency and reliable factor structure. The scale has been validated in the Indian population in a study that used HADS to screen for depression and anxiety. They also established sensitivity and specificity for various cut-off scores. The study suggested that the best cut-off values for the Indian population are '8' and '7' for depression and anxiety, respectively. A cut-off score of '8'on a depression subscale has a sensitivity of 75% and specificity of 76%, respectively, for a diagnosis of depression. Functional assessment of chronic illness therapy-spiritual well-being (FACIT-sp) - , This is a 12-item instrument with two subscales, one measuring sense of meaning and peace (10 items) and the other assessing the role of faith in illness (two items). A total score of spiritual well-being is obtained from the sum of both subscales. The responses for each item use a five-point Likert-type scale ranging from '0' (not at all) to '4' (very much). All FACIT scales are scored, so a high score is good. To achieve this, the authors suggest reversing the response scores on negatively-phrased questions and then summing the item responses. In cases where individual questions are skipped, scores are prorated using the average of the other answers in the scale. All subjects who consented were interviewed. Their sociodemographic and clinical details were collected, and they were assessed for pain and symptom distress using VAS and MDASI, depression and anxiety using HADS, spirituality using FACT-sp, and QOL using FACT-G and FACT-pal. For those who experienced difficulty in reading, the questions were read out and the responses were noted. Descriptive statistics were used to summarize the demographic and clinical details of the subjects. Computation of the mean scores on pain, distress, depression, spirituality, and QOL scales was done. The independent sample 't' test was performed for comparison of continuous variables. Correlations between scores on pain, symptoms of distress, depression, spirituality and QOL, and demographic and clinical variables were assessed using the Pearson's correlation. Around 76 patients were approached for recruitment, for the study. Out of them, five patients had co-morbid neurological conditions. One patient had a past history of depression pre-morbidly and was on treatment for the same. Twenty patients did not consent to participate in the study. Overall, 26 patients were excluded as per the study protocol. The remaining 50 were included in the sample. The distribution of different types of cancers in the sample was as follows: oropharyngeal cancers - 11 (22%), gynecological cancers including cervix, endometrium, and ovary - 11 (22%), lung cancer - 6 (12%), breast cancer - 6 (12%), stomach cancer - 5 (10%), and others - 11 (22%). The age range of the subjects was 17 to 64 years (mean = 49.74, SD = 10.17). More than half (56 %) of the subjects were women. Male and female patients did not differ significantly except in terms of socioeconomic status, with more males coming from a middle and women coming from a lower socioeconomic background (c2 = 13.99, p = 0.001). At the time of interview 50% of the subjects were living with their spouses and the remaining 50% were single. The mean spiritual well being (SpWB) score was found to be 24.48. The range of the SpWB score was from 4 to 48. Eight subjects had a score of less than 10. The mean spiritual score of the sample was just above 50%. This indicates that the sample was normally distributed. Depression (r = -0.862, P = 0.000) and anxiety (r = -0.0645, P = 0.000) correlated negatively with SpWB. The SpWB scores were negatively correlated with fatigue (r = -0.423, P = 0.002), distress (r = -0.717, P < 0.001), memory disturbance (r = -0.520, P < 0.001), loss of appetite (r = -0.399, P = 0.004), drowsiness (r = -0.400, P = 0.004), dry mouth (r = -0.381, P = 0.006) and sadness (r = -0.720, P < 0.001) [Table 1]. Spiritual well-being correlated negatively with mood (r = -0.630, P < 0.001), work (r = -0.376, P < 0.001), relationships (r = -0.624, P < 0.001), and enjoyment of life (r = -0.681, P < 0.001), variables of the symptom interference subscale of MDASI, which were statistically significant [Table 2]. 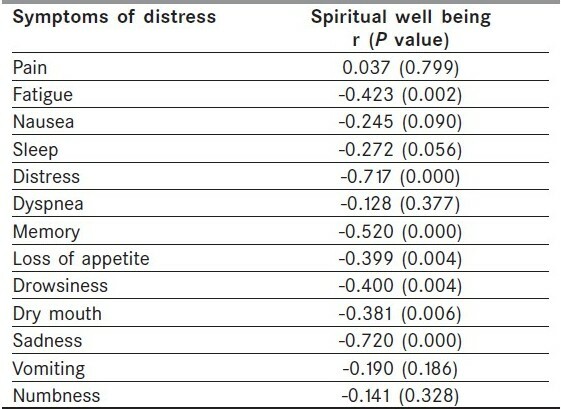 Spiritual well-being positively correlated with all the other aspects of QOL measures. The values are described in [Table 3]. The study was done in a hospice where all the patients were in an advanced stage of illness. There were a very few such systematic studies done from Hospices in India on this population. Assessment of spirituality as a determinant of the quality of life had been done systematically. The study assessed all the common symptoms of distress including the physical, emotional, and cognitive domains together, and it also assessed how much these symptoms had interfered in the patient's functional status and correlated with the spiritual well being. All the basic domains of the quality of life and palliative care well-being assessed were also correlated with spirituality. In conclusion, spirituality needs to be formally assessed and integrated into the management of patients with advanced cancers and those undergoing palliative care. The attitude of 'therapeutic nihilism' among physicians needs to be changed, and active help should be provided in improving the QOL of the patients that in turn will ease the inevitable process of dying. A longitudinal study from diagnosis onward, although difficult, will provide a clearer picture of the pattern and prevalence of symptoms and their correlation with the spiritual QOL. 1. Hermann C. A guide to the spiritual needs of elderly cancer patients. Geriatric Nurs 2000;21:324-5. 2. Fernsler JI, Klemm P, Miller MA. Spiritual well-being and demands of illness in people with colorectal cancer. Cancer Nurs 1999;22:34-40. 3. Hills J, Paice JA, Cameron JR, Shott S. Spirituality and distress in palliative care consultation. J Palliat Med 2005;8:782. 4. Silverstri GA, Knittig S, Zoller JS, Nietert PJ. Importance of faith on medical decisions regarding cancer care. J Clin Oncol 2003;21:1379-82. 5. Fisch MJ, Titzer ML, Kristeller JL. Assessment of quality of life in outpatients with advanced cancer: the accuracy of clinician estimations and the relevance of spiritual well-being-a Hoosier Oncology Group study. J Clin Oncol 2003;21:2754-9. 6. McClain CS, Rosenfeld B, Breitbart W. Effects of Spiritual wellbeing on end-of-life despair in terminally ill cancer patients. Lancet 2003;361:1603-7. 7. Moadel A, Morgan C, Fatone A, Grennan J, Carter J, Laruffa G, et al. Seeking meaning and hope: Self-reported spiritual and existential needs among an ethnically-diverse cancer patient population. Psychooncology 1999;8:378-85. 8. Chaturvedi SK, Shenoy A, Prasad KM, Senthilnathan SM, Premlatha BS. Concerns, Coping and Quality of life in head and neck Cancer Patients. Support Care Cancer 1996;4:186-90. 9. Aitken RC. Measurement of feelings using visual analogue scales. Proc R Soc Med 1969;62:989-93. 10. Joyce CR, Zutshi DW, Hrubes V, Mason RM. Comparison of fixed interval and visual analogue scales for rating chronic pain. Eur J Clin Pharmacol 1975;8:415-20. 11. Cleeland CS, Mendoza TR, Wang XS, Chou C, Harle MT, Morrissey M, et al. Assessing symptom distress in cancer patients. Cancer 2000;89:1634-46. 12. Zigmond AS, Snaith RP. The Hospital Anxiety and Depression Scale. Acta Psychiat Scand 1983;67:361-70. 13. Chaturvedi SK, Chandra PS, Channabasavanna SM, Beena MB, Pandian RD. Detection of depression and anxiety in cancer patients. NIMHANS J 1994;12:141-4. 14. Celia DF, Tulsky DS, Gray G. The functional assessment of cancer therapy scale: development and validation of the general measure. J Clin Oncol 1993;11:570-9. 15. Greisinger AJ, Weitzner MA, Lorimor RJ, Aday LA, Cella DF, Amato RJ, et al. Development of a quality of life module for end-stage cancer patients. Proc ASCO 1995;14:501. 16. Peterman AH, Fitchett G, Brady MJ, Hernandez L, Cella D. Measuring spiritual well-being in people with cancer: the Functional Assessment of Chronic Illness Therapy-Spiritual Well-being Scale (FACIT-Sp). Ann Behav Med 2002;24:49-58. 17. Brady MJ, Peterman AH, Fitchett G, Cella D. The expanded version of the Functional Assessment of Chronic Illness Therapy - Spiritual Well-Being Scale (FACIT-Sp-Ex): Initial report of psychometric properties. Ann Behav Med 1999;21:129. 18. Chaturvedi SK. Spirituality issues at end of life. Indian J Palliat Care 2007; 13:48-52. 19. Chaturvedi SK. Ethical Dilemmas in Palliative Care in a Traditional Developing Society, with special reference to Indian setting. J Med Ethics 2008;34:611-5. 20. Nelson CJ, Rosenfeld B, Breitbart W, Galietta M. Spirituality, religion and depression in the terminally ill. Psychosomatics 2002;43:213-20. 21. Plumb M, Holland J. Comparative studies of psychological function in patients with advanced cancer. II. Interviewer-rated current and past psychological symptoms. Psychosom Med 1981;43:243-54. 22. Bukberg J, Penman D, Holland JC. Depression in hospitalized cancer patients. Psychosom Med 1984;46:199-217.